In our ‘Hood Fundraiser Happy Hour! 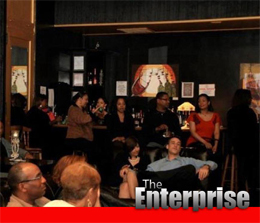 Join Pleasant Plains Workshop and Artspace DC for a fundraiser & happy hour at one of Georgia Avenue’s newest hotspots, The Enterprise Jazz Lounge! Enjoy drink specials, meet some of the artists, pick up your very own In Our ‘Hood T-shirt, and throw your hat in the ring to win $ in our 50/50 raffle! No need to RSVP, just come on out, and bring friends!